was a good friend and racing buddy of Dan Gurney. He was a skilled driver in his own right and had a solid professional career. 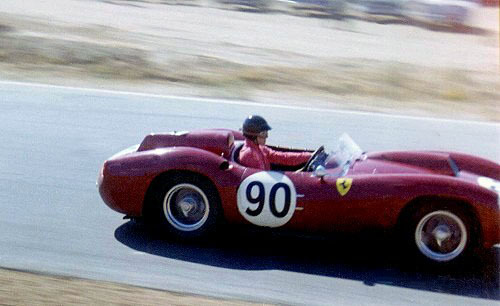 In 1961, he drove the famed 4.1 liter 4-cam Ferrari 412MI (#0744MI) for Bill Harrah. Here, Hudson goes out to qualify for the 1961 Riverside GP. Due to mechanical problems, he didn't make the race. This unique and extremely potent ex-Phil Hill Ferrari languished in the Harrah collection until rescued by Monterey Historics organizer Steve Earle in the early 1970's. It's now owned and raceed by Chris Cox. Hudson drove Team Meridian's scary ex-Cunningham Maserati Type 151 coupe #006 at an amateur race at Cotati in May, 1963. The car ran without doors so Hudson could escape in case of a rollover. He moved to Meridian's front-engined Chaparral (shown here at the June 1963 Laguna Seca USRRC event) for the pro races later in the year. In 1964 he drove a Cooper-Chevy successfully in USRRC events. He also drove Cobras for Carroll Shelby. Another look at Hudson in the Meridian Chaparral. 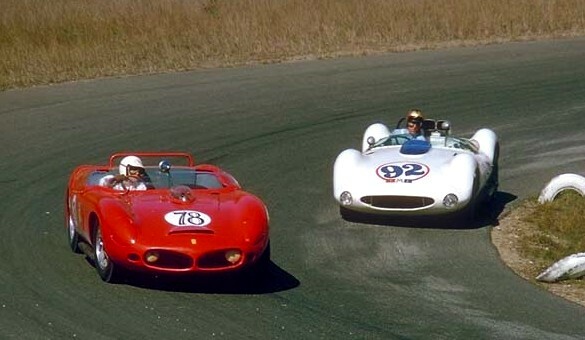 Here he battles #78 Stan Burnett in Ferrari TRI/61 #0794 at the Northwest GP, September 29 1963, at Pacific Raceways near Kent, Washington. Burnett was 5th and 4th in the two heats, Hudson DNF'd.